For one engine, that would be an acceptable expense. I have 3 engines, so I need to do all I can and offload the big stuff and matching/adjoining pieces to a vendor. A little more progress today. 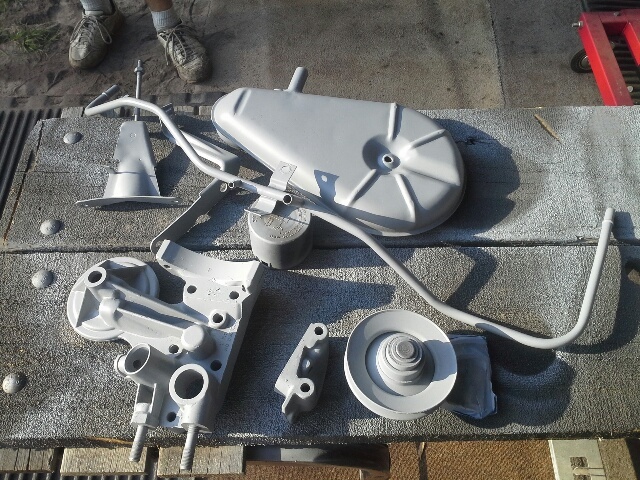 All small parts for the engine were bead blasted and primed. 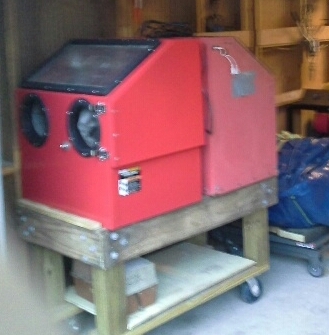 What type of blasting equipment do you use? HF bead blasted box with extra fine #13 glass beads.run pressure at 80 max. I have another HF blast box with playground sand in it. It is for thick steel parts like driveshafts and drums. I have a dual halogen light bar that I use to dry the sand a day before I use it. Each box has a LED strip light mounted in it and a air hose attachment mounted also. Sounds like a nice setup. I had purchased one of the HF blasters, and beads, but it didn't work well and I returned it. Lemon maybe? I trust you wear a respirator when blasting with sand - silicosis risk when using sand. This is the blast box table I built for my 2 blast boxes. I use a HF 29 gallon 7.5 SCFM @ 90 psi compressor to provide the air to blast. It now takes 80 feet of hose to box to use it. My new blue classic Chevy is residing in my maintenance bay temporarily. Compressor noise is now non-existant. I also place a high volume fan behind me to keep air flowing away from the box. I have a Home Depot bucket vacuum with a muffler which collects most dust that the 2 inches of water in the bucket doesn't catch. Oh yes, blast box is moved outside in the shade to help with airflow. The LED light in each own is bolted to the top and has a lighting of a 100 watt bulb. It makes working the box nice where you can see what you are doing. It has no switch as dust would make it useless when it gets contaminated. Edited 1 time(s). Last edit at 04/24/2017 03:52AM by Lane66m. Great idea to put it on wheels. It let's me move it around the outside of the garage for shade and prevailing wind. 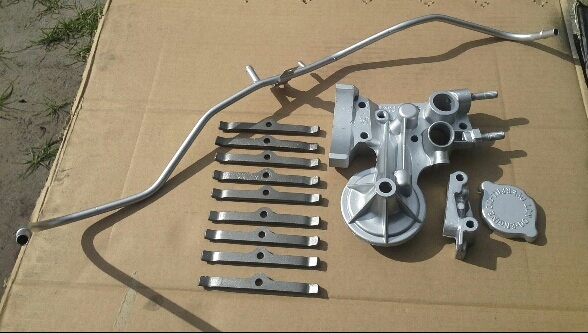 Here the photos of the parts painted up. Tomorrow is last day of work on the engine prep. Trip to Augusta tomorrow, get ready for Helen trip Thursday and enjoy trip to Helen Friday through Sunday. 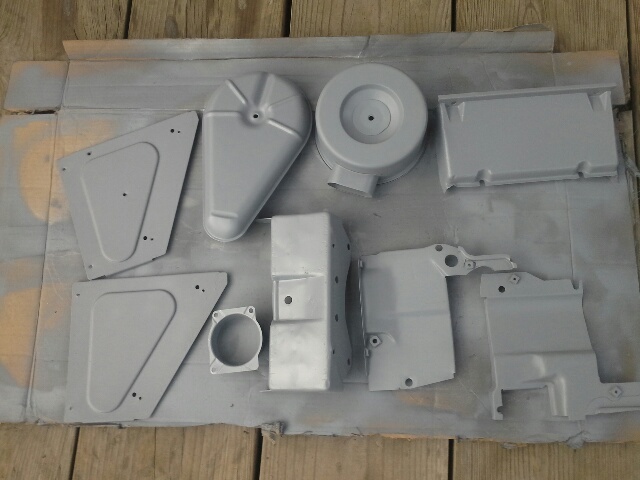 And a few more parts got bead blasted and primed. Getting ready for Helen. If anyone needs a PG, I have I can bring. $50 delivered to Helen. 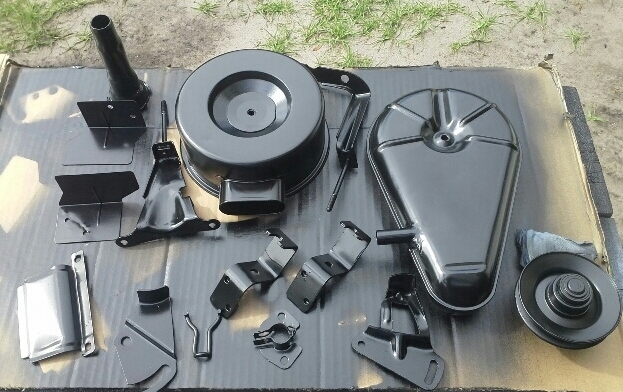 I got the first coat of final color paint on the parts yesterday morning. I will finish them up Monday. We got the final paint on the lastest batch of parts. Shrouds and door boxes remain. All Vair projects work,has been suspended for about a week. 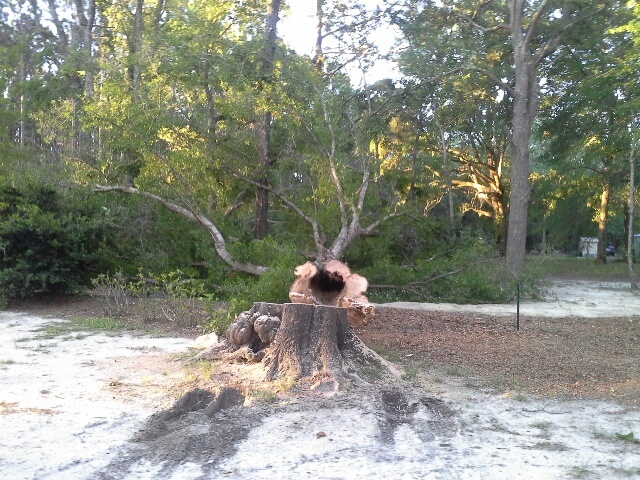 I had a guy with a rough terrain fork lift help me take down a very large water oak tree. The center had rotted out. The tree fell across one of my drives. Now have to clean it up and get rid of the stump. Some more progress on the Greenbrier. 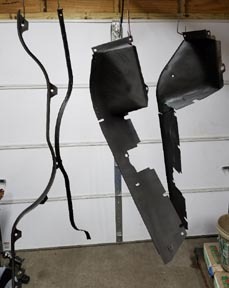 Some more parts painted and ready for installation. We have 6 more large pieces left that don't fit blast box. I will show you setup I will assemble to blast these parts. Rick came over and help me with the stripped out #6 spark plug hole. Sav-a-thread was installed. Other 5 holes cleaned up with a thread chaser. All plugs installed but awaiting torque setting. It will be dine tomorrow. 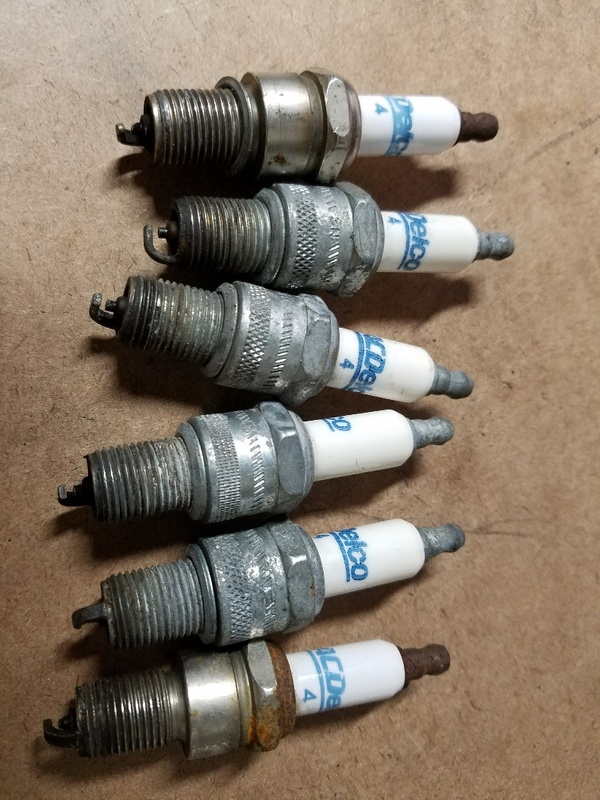 Last photo shows the plugs I pulled out of the engine. They were only installed halfway in. I plan on starting installations of all the parts we have prepped. Top cover first tomorrow morning. Those plugs you removed..... The things we find! I had to grin at that one. If the plug threads are too long, just thread the plugs in 1/2 way! Looks like your getting things properly sorted out. As for the Oak tree..."timber"! That tree made quite a lengthy yard fire. I still have a 25 ft trunk to cut up and burn. Unfortunately no one wanted to come cut up the tree to firewood size and take away at no charge. All wanted me to cut it up and deliver fifth them but they wouldn't pay a reasonable price for the wood. So burn it up was the only solution. Yes, it is hilarious what people do to the Vair's the own, but this PO screwed up a plug hole with his mod. All the rest had carbon built up in the bottom threads. Cleaned up a few more small pieces today. 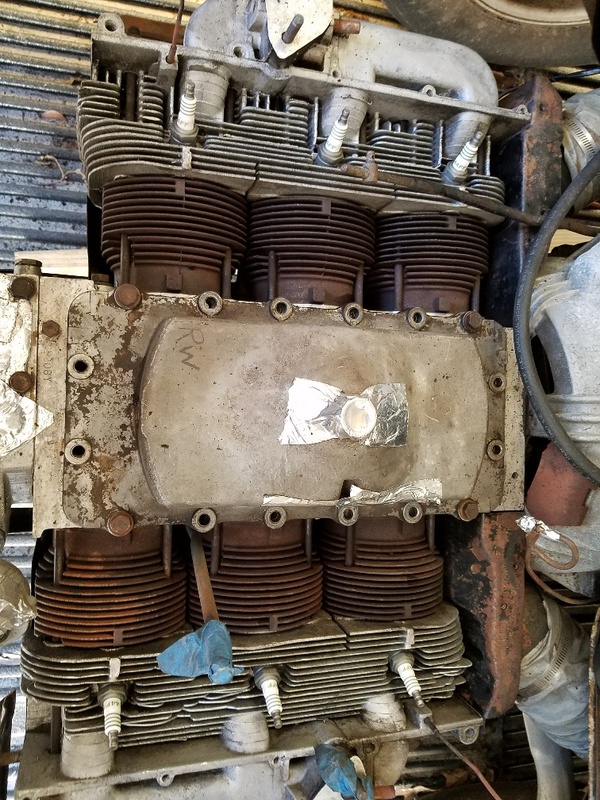 Will mount top cover in a couple hours, Tomorrow blasting of large pieces for all three engines will be undertaken, weatherpermitting. Slight delays in goals on the Greenbrier. I got the top cover and diffuser mounted today. Cover bolts had Blue Moly applied lightly to threads and torqued to 13 ft lbs. Also installed lower vent tube with clamp and hardware. Blue Moly on bolt threads again and proper torque. 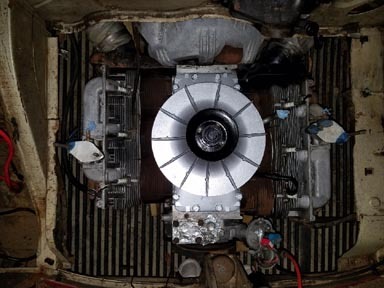 Installed the LM magnesium fan and fan pulley, as I had updated the cover and fan bearing/housing with one I had from the LMs I scrapped out. 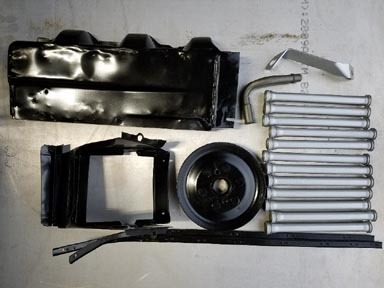 Blue Moly anti-seize doesn't have any metals in it that will cause dissimilar metal galvanic action. Great for steel to aluminum connections. Yes, I did use Gasgacinch on the gaskets. Stuff smells like glue. 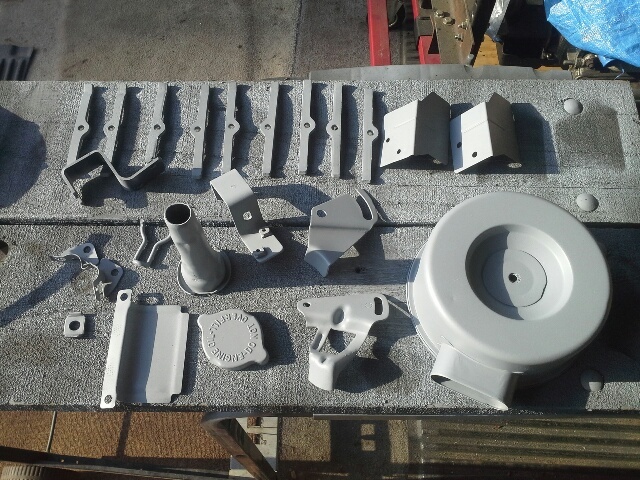 Also, we got a few more parts blasted, cleaned and primed. The ones on the table are painted and ready for installation. The hanging ones are primed only. I need to do 3 more large parts and all parts will be done for the Greenbrier, except for the couple still holding the engine in place. I'll post my outside blast setup when I have it set up again. Started to rain on us, so it came down in a rush. Work will cease on Vairs and Camaro after Saturday , so we can prepare for trip to Maggie Valley. Fine looking parts you got there Al! What did you use to paint the push rod tubes? I wish I could go to Maggie valley. I took a large card board box and stuck twelve 5 inch screws into it with good spacing. With tubes vertical, I primed with VHT grey primer and final coat of VHT Universal Aluminum. One tube has a run I have to sand out and repaint. Dang wind moved the spray onto area I just sprayed. On your engine picture one head is not the same as the other! Check your numbers out.